Note engraving is FREE. Enter the the text you want engraved right here. If you want a state capital engraved you can enter that here as well. 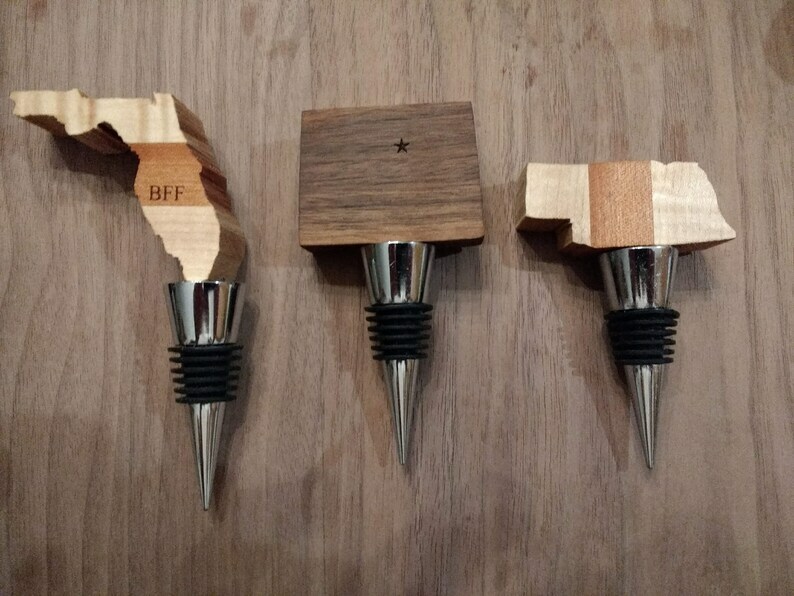 Shaped like a state these stoppers are perfect to complement special state wines, or to show your state patriotism. Perfect gifts for weddings housewarmings or any special occasion, these stoppers look good everywhere. Each stopper is handcrafted in any of the 50 state styles from your choice of cherry maple, black walnut and red oak. Engraving is free with your order. Keep in mind as you are selecting from our wood choices that the piece we send you may look different from the pieces in the pictures. This is due to the amazing variability of wood the wood we use, and adds to your pieces' uniqueness! I will be posting several other bottle stopper selections so make sure to check out my shop. As soon as we receive your order we will begin creating your wine-stopper. Your order will be shipped within 1-2 weeks of purchase. Join the hundreds who have purchased our products we guarantee you won't be sorry! Golf Ball Wine-Stopper Ships Next Day!